Pre – P.S. Enrollment for the live version of Make It Stick Habit School opens March 19th. My last live course sold out in four (4!) days, so if you’re interested, I’d encourage you to jump on the wait-list! Raise your hand if you’ve uttered something like this within the confines of your mind! Maybe Instagram isn’t your vice of choice. Maybe the bad habit you can’t kick is online shopping, smoking, mean-spirited gossip, leaving a mess everywhere you go, or eating an entire bag of pizza rolls as ‘second dinner’ every night. Whatever the bad habit, it’s very possible that you’ve had some version of this conversation with yourself. The conversation where you hold up your accomplishments and wonder why you can do something so seemingly hard – get the dream job, graduate with honors – but you can’t stop stalking your ex on Facebook. 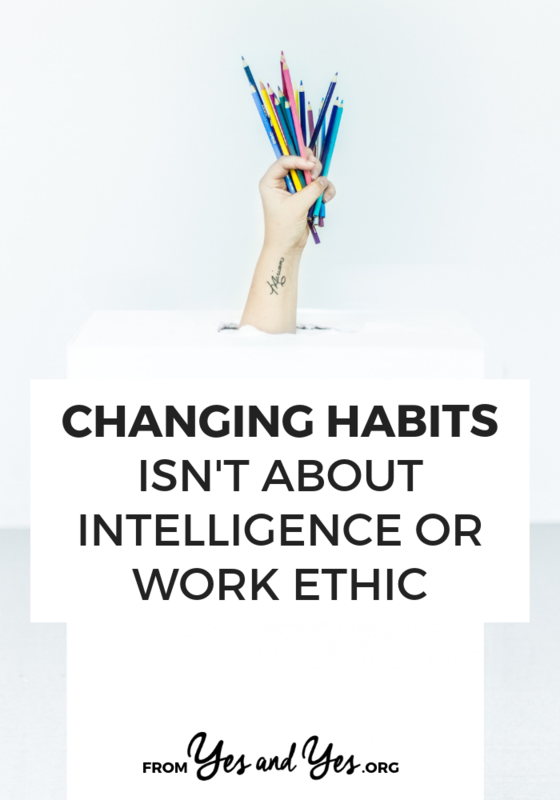 If you’ve ever done that:Good news/bad news: Habit change has nothing to do with intelligence or work ethic. We can’t outsmart or outwork our bad habits. Click To TweetLarry King had terrible spending habits and declared bankruptcy twice. President Obama struggled with a smoking habit for years. Oprah Winfrey has been very open about her challenges with fitness and eating habits for her entire career. I think we can all agree that the above mentioned humans are smart and hard working. So how do we break bad habits if we can’t out-smart or out-work them? What I can tell you is three more things very few people are saying about breaking bad habits and building good ones. What now? Yes. If you’ve ever believed that you’re “too lazy” to break a bad habit or build a good one I’m here to share to tell you that laziness isn’t, uh, really a thing. What often looks and feels like laziness is actually procrastination, anxiety about the outcome, or confusion about where to start. Sure there are times that we simply don’t want to do something – who truly wants to empty the dishwasher? – but most of our ‘laziness’ is actually something else entirely. Oh, what’s that? You mean that you’re trying to change a habit that’s NOT weight-loss related? You feel discouraged when you don’t see progress after, like, three days? Using a habit-tracking app on your phone leads you down an Instagram wormhole that just makes you feel bad? Fun fact: that ’21-days to a new habit’ stat we see floating around is totally, completely false. On average, it takes people 66 days to truly cement a new habit. And that can vary from 12-265 days! And it’s different from person to person and habit to habit! So, if you tried to build a new habit for 21 days and it didn’t stick – it’s not that you did it wrong. It’s just that you’re probably only 30% of the way there. 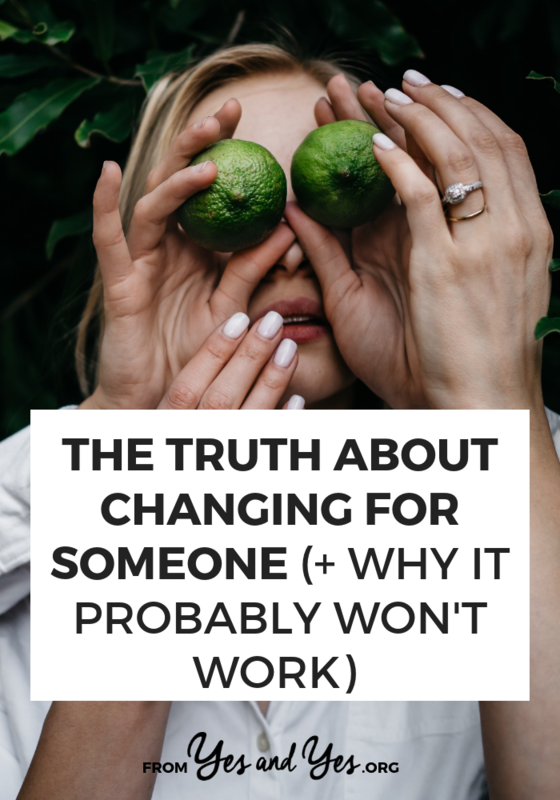 The truth is, habit change is both harder and easier than we’ve been lead to believe. It’s not just a habit tracker app and doing something every day for three weeks. 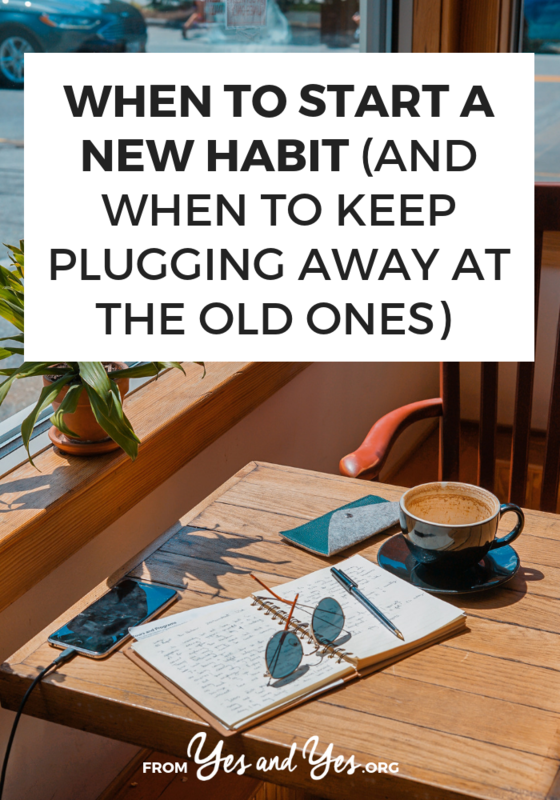 Like a lot of things in life, habit change is simple; it’s not necessarily easy. Knowing that you’re not ‘doing it wrong’ is a huge step in the right direction. Have you struggled to make habit change stick? Or fallen for the 21-days myth? If you’ve successfully changed a habit, tell us how you did it in the comments! P.S. The wait-list for Habit School is here! Doesn’t this sound like 1997? What’d you get up to this week, friends? I finally saw Bohemian Rhapsody, warmed myself at the Como Park Conservatory, and celebrated filing our taxes with a meal at The Red Stag Supper Club. I hope your week was also filled with flowers, movies, and good food. I’m an under-buyer and I’ve had this $30 item in my Amazon cart for LITERALLY A YEAR. I finally bought it and, yes, it’s as amazing as I’d hoped. Somewhat related: over in the Money & Happy Facebook group, we’re having a really great, honest conversation about family financial support and it’s very illuminating. This is why we need The No Grocery Challenge! ? And also somewhat related: If the open rates of your business’s newsletter have been going down, you’re not alone! Deliverability rates have decreased across many providers. I just want you to keep in mind that “shopping for symbolic jewelry items” may not come “naturally” to your chosen spouse, but he had and continues to have choices open to him. Some of these choices are: 1) Goobingle it 2) There are many step-by-step guides! 3) You can make the decision/ask the question about becoming engaged and save the whole darn jewelry bit for later, 4) Or use a silly/fun/cheap stand-in prop if the ritual is important 5) You can ask for help, like“Can we take an afternoon and sort this out together?” 6) You can ask for specific suggestions, like: “Here is my approximate budget, can you show me some examples of rings you might like, or would you like to pick something out together?” 7) You can set/manage expectations: “I haven’t mentioned it before because I saving up so I can get you something really nice and I wanted it to be a surprise, but it doesn’t have to be a surprise if waiting is stressing you out so much!” IF PEOPLE WANT TO MARRY YOU, THEY HAVE MANY WAYS TO LET YOU KNOW. You told him this particular step/symbol was important to you more than once, so it shouldn’t be a mystery that it’s important to you. A cute idea for gardening this spring! I love Wendy’s ideas for different ways to style what you already own. How was your week, friends? We had YET ANOTHER giant snow storm here in Minneapolis. We’ve had to dig trails around the yard so our little dog can go outside! As you read this, I’m back in Costa Rica, leading another retreat for Fit & Fly Girl. Lucky, right? You can follow along on Instagram if you need photos of beaches in your life! After 20 years + 38 countries, 7 travel tools I won’t shut up about. Every time I share a photo of our dog Loretta in her bright pink, full-body snowsuit people want to know where we got it. Now you know! Ooof. Yes. I’ve been here SO MANY TIMES. Get in the water. I love this 20/20/20 rule. I found my first grey hair last year and I don’t intend to do anything about it (mostly because you can’t really see grey hair on blondes). But I loved this story about women who have gone completely grey and love it! A great idea if you’re sentimental AND a minimalist. If you’ve ever wanted to see me politely fight with people in Instagram comments…. A tour of a pretty 350-square foot apartment. Love that sofa! Did you sing along to Baby Beluga as a kid? Apparently, Raffi is the world’s nicest hardass. I do not have a toddler, but this made me laugh. Raise you hand if you’ve fallen into this trap: feeling obligated to turn a hobby into a hustle.